William F. Buckley, Jr., and Norman Mailer were the two towering intellectual figures of the 1960s, and they lived remarkably parallel lives. Both became best-selling authors in their twenties (with God and Man at Yale and The Naked and the Dead); both started hugely influential papers (National Review and the Village Voice); both ran for mayor of New York City; both were noted for their exceptional wit and venom; and both became the figurehead of their respective social movements (Buckley on the right, Mailer on the left). 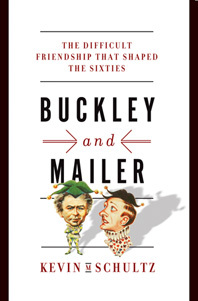 Indeed, Buckley and Mailer argued vociferously and publicly about every major issue of their time: civil rights, feminism, the counterculture, Vietnam, the Cold War. But behind the scenes, the two were close friends and trusted confidantes. In Buckley and Mailer, historian Kevin M. Schultz delves into their personal archives to tell the rich story of their friendship, their arguments, and the tumultuous decade they did so much to shape. Here is the entertaining and deeply American story of what Mailer himself called a "difficult friendship": from their debate before the Floyd Patterson–Sonny Liston heavyweight fight in 1962 to their failed mayoral campaigns, to their confrontation at Truman Capote’s Black-and-White Ball, to their starring roles in the central events of the ’60s, including the giant antiwar rally in Berkeley, the March on the Pentagon, and the national political conventions in Miami and Chicago. Through it all, Schultz charts their friendship, whether sailing together off the coast of Connecticut, celebrating rave reviews and grousing about lousy ones, and defending each other's decisions privately even as they attack each other’s positions publicly.